Version 3.0 with Clear Silicon Nonslip Backing. The NAC&ZAC Deluxe Hammock Pet Seat Cover is made from extremely durable polyester, and there are 3 layers to protect your back seat from dirt, muddy claws, and wet hair. The padded car seat cover is soft and comfortable for your pet and makes a classy looking for your car. The nonslip backing and multiple attachments can hold the cover in place when your dog jumps in and out of the car, even on leather seats. Extra side flaps on both sides to protect the entire back seat. And the seat belt slits with self fastening closures allows the seat belt buckles easily get through and keeps unwanted pet hair out. You can use the Bonus Pet Car Seat Belt in package with our hammock seat cover to keep your dogs safe during sudden stop and turns. The Seat Cover is 56″ width X 63″ length, the adjustable straps make the Pet Seat Cover work for all cars and SUV. – Padded and Quilted, comfortable for your pet. 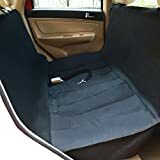 Recommended to be used together with NAC&ZAC Deluxe Bucket Seat Cover (search B014GYA9FQ on Amazon) and NAC&ZAC Pet Car Door Protector Cover (search B00AEB7FOY on Amazon) to protect the entire interior of your car. Version 3.0. CLEAR SILICON NON-SLIP BAKCING & EXTRA SIDE FLAPS. Our heavy-duty pet seat cover protects you entire car seat from claws, paws, spills, dirt & fur. 56″ width X 63″ length, fits most cars and SUV with headrests. Extra side flaps protect both sides of your seat when dogs jumping into the car. 360 degree protection of your car seat. The cover is soft and quilted, comfortable for your dogs to sit on. Clear silicon non-slip backing, sturdy quick release clips and straps. WATERPROOF& HAMMOCK CONVERTABLE. The pet hammock has 3 layers, while the middle layer is waterproof PE material, no smell and no harm to your pet. Waterproof and protects your car seat from any liquid. Converts to a standard seat cover or creates a hammock effect. EASY TO INSTALL & CLEAN. Easy to install with quick release clips. SEAT ANCHORS and EXTRA ELASTIC STRAPS also help make the cover a snug fit. The top layer is made from durable canvass-like material, easy to clean with a damp cloth or just vacuum. Our pet car seat over is also machine washable. EXTRA BONUS PET SEAT BELT. Each seat cover also includes one bonus pet car seat belt.